Sports provide your child with many benefits including physical exercise, fun, confidence and a sense of community. And for many children, sports are the most natural and joyful way of expressing grace and excellence in their young lives. With these benefits in mind, and hoping to provide the best opportunities for your child, you and other parents dutifully sign up your young children for the local youth program of choice. Surely this is the single best way for children to pursue their interest in sports, develop their abilities, and get the most out of the experience. But is it? Organized sports, administered by adults, offer one path for a child to learn and appreciate sports. Skill clinics and traditional developmental youth leagues ideally enable knowledgeable coaches to teach children specific sports skills and team play along with sportsmanship and life lessons. Proper instruction, balanced with competition suited to the age group and skill level, can provide the program’s youth participants with a great experience. In addition, activities are supervised, helping to ensure the safety of your child. Don’t make the mistake, however, of believing that organized sports by themselves will provide your child with the best overall sports experience. Organized sports are only one part of the equation. In my youth (and possibly yours) playing and learning sports was a multi-faceted developmental experience. It began with my Dad introducing me to sports by playing catch and providing some basic instruction. Too young to play in a youth league back then, I can also recall my Dad occasionally taking me to a local baseball field on a warm summer evening to watch a Little League baseball game. Mostly, I remember the stop afterwards for an ice cream cone. In elementary school, a gym teacher began our basic instruction in a variety of games and modified sports. Games of kickball during gym class and recesses provided a fun introduction to team sports. At seven or eight, I played in my first neighborhood pickup baseball and football games. Being one of the youngest, I only hoped to get an occasional chance to catch the ball and take some swings at the plate. 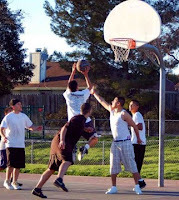 I was thankful for the opportunity to play with older boys and be part of the neighborhood group. As I grew and became a more accomplished athlete, my role increased—and this success only fueled my enjoyment and interest in sports. But it’s essential to understand that these neighborhood games were much more than just playing sports. They were also about learning how to interact with other children—without the help of parents or other adults. We learned how to recruit neighborhood kids, organize the game, deal with arguments, balance our individual competitive instincts against the needs of others in the group , and otherwise manage the game so that everyone wanted (or at least continued) to play. Often, it was a balancing act to keep everyone satisfied and the game going. Depending on who was playing and our mood, the games emphasized either relaxed fun or more serious competition. But most importantly, we controlled our experience—we learned to become more self-reliant. For us, the organized sports activities of our youth were separate, complementary experiences that helped fill our weekday evenings and Saturday mornings. In some ways, organized sports represented the formal test of our daily fun and games. We accepted that these youth leagues were run by parents, more structured, and usually more competitive. It was still an exciting, satisfying experience—run by caring coaches who balanced competition, learning and fun. That’s not to say there weren’t moments of stress, fear, and boredom—or the occasional poor coaching. In my first year of football, I was the youngest (and lightest). Trying to tackle bigger boys was a scary experience. While playing youth baseball, I also recall each year facing a pitcher who had an unbelievable fastball, but who also was very wild. We all were fearful of that pitcher, but knew that if we took enough pitches there was a good chance that he would walk us (but hopefully not hit us). So what were the crucial elements comprising my youth sports experience? They were involved parents, gym teachers, neighborhood pickup games that provided an opportunity for unstructured, self-organized play—and organized sports. The latter was only a part of the whole. But it’s a new world—and some of the changes are clearly ones for the better. Title Nine, for example, has opened the world of sports to millions of young girls. Other changes include more two-paycheck families, more single parents, 24-hour news that sensitizes us to the potential dangers our children face on their own, and an expanded universe of non-sports activities available to a child. Unlike Title Nine, these changes are more mixed in their benefits and drawbacks. But one truth is certain, parents now lead lives filled to the brim with personal and family activities. In a generation of busy parents, it’s no surprise that organized sports have now taken on a much larger role. Scheduled, highly structured, and safe, organized sports more easily fit into today’s lifestyle. Why not expect that organized sports can be the beginning and end of your child’s sports experience? Unfortunately, placing these heavy expectations on an organized youth sports program is bound to result in failure of one kind or another. A limited number of volunteer coaches with varying degrees of expertise, multiple age groups and skill levels bunched together into single leagues, and different attitudes regarding how to balance fun and competition, all make it difficult to produce a program that fully satisfies the needs of every participant. As a result, complaints arise that traditional youth sports programs are too competitive, do not provide equal playing time, and fail to give younger beginners and less-skilled children the best opportunity to learn and have fun. So how do we provide the best sports experience for our youth in today’s world? I would suggest that parents embrace a principle embodied in our past—balancing participation in organized sports with the other developmental opportunities that include direct parental involvement and separate, self-directed play by the children themselves. Don’t simply outsource your child’s sports education to an organized youth sports program. If you are not comfortable with unsupervised play, or your work schedule keeps you and your child away from home during the day, then try to find a facility where your child can play with others in a self-directed setting. For example, it’s not unusual in the afternoon at the local YMCA to see younger children involved in either a fun two-on-two pickup basketball game or a more competitive full court game. The YMCA provides a safe, semi-supervised environment that still provides children an opportunity to do their own thing. And finally, take an active interest in your child’s organized youth sports experience. Find the local programs that offer the best blend of fun, learning, and competition that fits your child. Be supportive. But also strive for a healthy balance between parental involvement and providing your child with the freedom to explore sports on his or her own. Don’t believe that organized youth sports programs are the entire answer or that you are a poor parent for not placing your child in every available program. You may find that everyone in the family benefits from less emphasis on organized sports. Great post! I agree that is is very important that kids play pick-up games on their own outside of organized sports. It teaches them how to interact with others of varying ages and work problems out on their own. I had so much fun playing kickball or basketball with the neighborhood kids when I was young! Thanks Caitlin for your thoughts! A lot of blogs I see these days don't really provide anything that I'm interested in, but I'm most definitely interested in this one.